I injured myself over 30 years ago in a snow skiing accident, and ever since I’ve had chronic back pain. It has been so severe as to be disabling, although over the years I’ve learned a lot of different exercise and lifestyle techniques that have helped me get back into life. But the first thing to really help me feel better and be able to participate more in life was memory foam. After years of waking with stiffness and pain, and feeling tired as though I hadn’t slept, it was literally amazing to wake up after sleeping on memory foam and feel refreshed, and not nearly as stiff and with very little pain. I remember like it was yesterday — the first time I ran across memory foam. And I did, and as they say, my life was never the same. From this first time touching memory foam, I knew it felt like something that might help me sleep better and wake with less pain and stiffness. Back then, though, there wasn’t any reasonable memory foam options, so I paid about $900 for a 3″ topper pad for my Full size mattress. I didn’t know what to expect, but from the first night I used it I found I slept deeper and better, had less hip and shoulder pain, and also it was one of the first things to help me feel less back pain in the morning. I never intended to get into selling memory foam, but somehow the word spread through family and friends that I had this odd new topper pad on my bed, and people with pain or sleep issues started coming over to lay down on my bed. And a few, and I’m not making this up, felt so cozy they actually went to sleep while giving it a try. People started asking me where they could get it, I checked into it, and voila — I became the foam guy. And while I know from years of experience that memory foam is great for comfort and pressure point relief, for me the real draw of memory foam was in waking up with less back pain and stiffness, and feeling rested. My experience with my customers who have back pain has also been very positive — about 85+% or tell us that they get a lot of relief for their back pain using our 10″ Memory Foam Mattress or by adding a topper pad to their bed (if it is generally supportive, but just overly firm). Why does memory foam help alleviate back pain in so many of our customers as well? It is due to the unique way that memory foam works to relieve pressure points and conform to your body’s contours. Memory foam is temperature sensitive, unlike ordinary foam, so it react to your body’s temperature to soften in areas of your body that are warmer – so it softens around your hips, shoulders, etc, to conform to your body. Memory foam also has a unique cell structure that allows it to spread pressure through its cells. So where you have more pressure points — again your hips, lower back, shoulders, etc — it reduces these pressure points very effectively (which you can see on those pressure relief maps — the pressure points show as much lower using our the memory foam we use in our mattress and toppers). 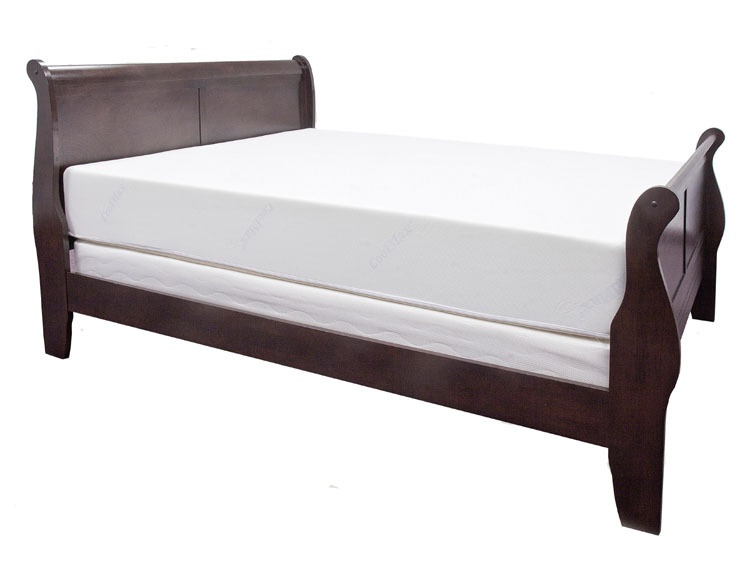 The way memory foam relieves pressure points reduces also the need to toss and turn to get comfortable. This is especially important for those with back pain. When you do change positions, the memory foam “remembers” its original position and then gently settles in to your new sleeping position. Although memory foam is not a back pain cure-all, experts who recommend it are correct in suggesting memory foam as part of the solution to your back pain problem. But everyone’s back pain is individual, and you never know if this will be affective for you till you try it. Which is why we offer our unmatched 365 day money back trial. I want those of you who have back pain and are suffering to be able to give it a try if you think it might make sense for you, without being stuck if it doesn’t. To get a sense of whether our 10″ Memory Foam Mattress might be an option for you, please read over some of the reviews — there are plenty from folks with back pain issues, and hopefully on reading these reviews you can get a minds’ eye of whether our mattress might be worth a shot. For more information on our 10″ Memory Foam Mattress, and to read over some of the 380+ reviews and see why 95% say they would recommend our mattress to a friend, see our 10″ Memory Foam Mattress Page. Previous Previous post: Can You Use a Memory Foam Mattress Topper on a Sofa Bed?